Many of us have dreamt about writing a hit song, right? How many actually have? Yip, I too, have tried my hand at penning song lyrics but found out that there's much more to it than writing a few rhyming lines. Two-time Oscar winner ("The Morning After" from The Poseidon Adventure and "We May Never Love Like This Again" from The Towering Inferno) Joel Hirschhorn, gives us the necessary tools to write a song correctly. He emphasizes the need to think visually, to find ideas, become a storyteller, and "how to analyze hit songs and song titles to see what works and why". One's emotions are a huge well of inspiration if we learn to write about them. This book is divided into five parts and covers all aspects from collecting song titles to hooks and from country to the stage and movie songs. He also covers working as a collaborator and about royalties and payment and copyright. Throughout this book you'll find references to some great songwriter or other as well as hints and tips, which I found very interesting. There's a comprehensive glossary and appendix which is extremely helpful, with names and addresses of record companies, publishers, and competitions. The best news is that you don't have to be musically inclined to write songs. It helps but is not a requirement! 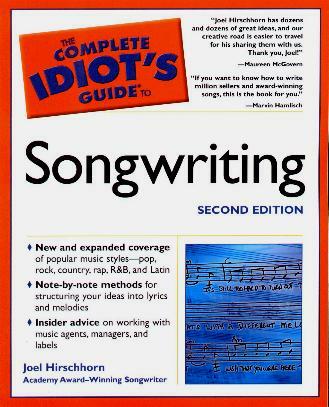 Conclusion - Very informative and a useful tool for those needing help writing songs.